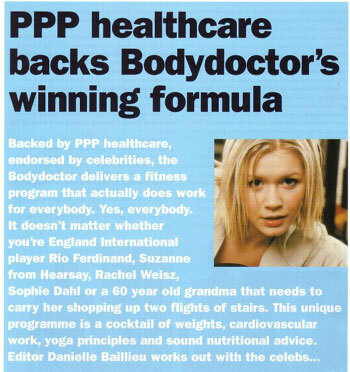 Backed By PPP, endorsed by celebrities the Bodydoctor delivers a fitness program that actually does work for everybody. Yes, everybody. It doesn’t matter whether you’re England International player Rio Ferdinand, Suzanne from Hearsay , Rachel Weisz, Sophie Dahl or a 60 year old grandma that needs to carry her shopping up two flights of stairs. This unique program is a cocktail of yoga principles, weights, cardiovascular work and sound nutritional advice. The brainchild of David Marshall aka the Bodydoctor it is a program that has produced amazing results. It couldn’t have come at a better time. Obesity is a growing problem. One of Britain’s top nutrition specialists has warned that obesity is threatening the health of a growing number of people world-wide. Experts say a combination of bad diet and lack of exercise is making obesity a serious threat in the UK. Professor Peter Kopelman who runs the obesity clinic at the Royal London Hospital said: “there is a major concern about the increasing proportion of the population who have a major weight problem. The World Health Organization has said obesity is the biggest unrecognised health problem in the world. Professor Kopelman said bad diet was part of the problem, but lack of physical exercise was also a significant contributory factor – particularly in the UK. “The fact is that we are in danger of becoming a nation of couch potatoes,” said Prof Kopelman. He said only a small number of people were aware of the problems of obesity, partly because the impact on health tended to come many years later. Obesity is associated with an increased risk of heart disease, high blood pressure, diabetes and respiratory problems. He stressed that if people did lose weight – even relatively modest amounts – their health would improve considerably. Heather Clark who is an A & E hospital consultant and Sports Medicine doctor to QPR football club works out at David Marshall’s private gym in Primrose Hill North London. She told us “people don’t realise how important it is to exercise. David’s program is so good because it’s easy to follow, anyone can do it and get results. Not only has David’s routine won the hearts of the celebs and VIP’s that attend his private club paying £80 a session (£1600 for 20 sessions) but its managed to get the nod from non other than leading healthcare giant PPP who have gone into partnership with him. It’s the first time a private medical group have backed and promoted a fitness programme in the UK. Darrin has put the programme to the test. In six weeks (he’s been training at David’s gym 3 times a week) he’s managed to lose 10lb’s and more importantly has gone down about two trouser sizes. Suzanne from Hearsay is now on her second set of six weeks of training with the Bodydoctor. “When I’m in London I try to workout three times a week. After the first six weeks I went down one dress size from a 12 to a 10. That was great because the tabloids were all saying I was overweight. Then they started saying I was losing too much. You can’t win. The beauty of it all is that now I just don’t care. I’ve carried on doing the programme because it’s keeping me toned and it makes me feel good. How did David come up with this unique programme that has already sold 20,000 copies ? Once a keen footballer David suffered a knee injury followed by an operation that did more harm than good. He tried all the training programmes there were in an attempt to get better to no avail. In the end he took the matter into his own hands using himself as a guinea pig. Trial and error finally led to todays perfected Bodydoctor programme. “I’m not a trainer. I’m a fitness teacher.” He says. “Most trainers you know the ones I mean- we call them the testosterone cowboys- all they care about is the way they look. I care about the way you want to look. If they’ve got a great body and have never had a weight problem how are they going to understand what it’s like for you when you’re tempted by a pie and mash, chocolate or whatever. I’ve been extremely fit and unfit. I know what it’s like to be overweight and out of shape. My programme gets results for everybody. Everyone can now be healthy. Health and fitness should not be just for wealthy people. That’s why we have the Bodydoctor manual, CD and video for just £60. You can see what exercises you have to do, you can watch the video and you can listen to me on the CD in real time while you are doing the workout whether at home or in your local gym. If you can afford it I can assure you that the entertainment is worth it. David takes no prisoners. He gives it to you straight. A style I personally admire. When I was put through the programme first time I was expecting to ache like hell. Amazing. I felt energised but no aches. And no aches or pains the next day either. The reason for this as I later discovered is that the sequence of the 23 exercises has been carefully worked out so that each one counter balances the previous one. You start off with a gentle warm up followed by the upper body routine, lower body routine, stomach routine and stretches. Muscle is the key to the programmes success. A common misconception is that only cardiovascular work burns calories and fat. However this is only true to the point your muscles create the energy appetite and body fat is the chosen source of food. The more lean muscle you have the more calories you burn whether on a bike, stepper, treadmill or rower. According to David if you don’t balance your workout with Resistance (muscle) work, Cardiovascular work and Flexibility you will have an unbalanced body and an unbalanced workout. If the weights only allow you to complete between 4-8 repetitons : Build max strength, but do not burn fat. 20-25 reps(muscular exhaustion): build minimal muscle, burn max fat. Work with weights that exhaust you between 20-25 reps.
Don’t rely on scales-the tape measure never lies.